ABA communications cover a wide range of topics and specialties. To help direct our emails to the correct staff member, please tell us exactly who should receive which emails. The Main Store Contact will receive all communications for all topics. Additional names and email addresses can be listed for the specific topics listed below. If left blank, the Main Store Contact will be the sole recipient of emails on that topic. 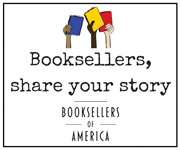 This contact form does not apply to subscriptions for ABA's weekly e-newsletter Bookselling This Week. To sign up to receive BTW every Wednesday, please visit this page.